Writing about the Drivers of Change is perhaps too ambitious. We may not even be aware of some of these drivers. An Arup Foresight article pointed me towards a new driver of change: convergence of business, science and technology. However, convergence (towards intelligent life) also seems to be a main driver in the blueprint of Life, Nature and probably the Universe. Climate change is a common example of a driver of change. I'm not talking about man-made climate change because climate change is far too complex for humans to understand. Of the 9 known causes of climate change, 2 relate to the Universe (meteoroids, Sun), 1 partly to humans (greenhouse gases), and the other 6 are "earthbound": axis, CO2 in oceans, ocean currents, orbit, plate tectonics and volcanic eruptions, and vegetation coverage on land (BGS). 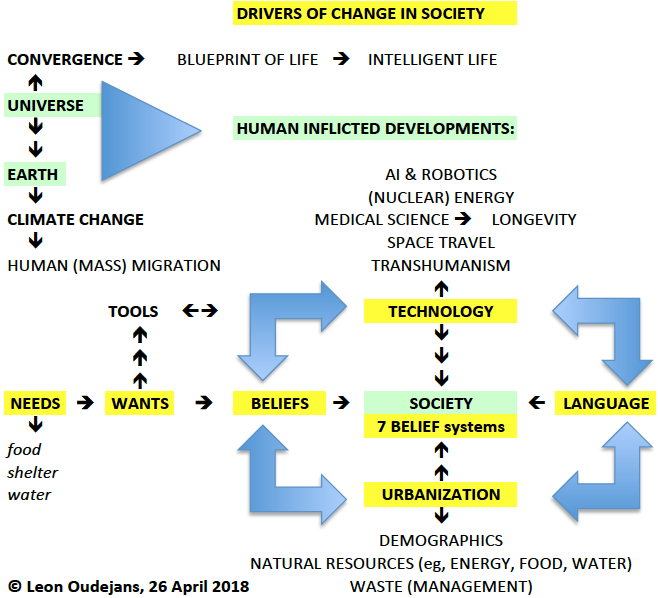 The 4 remaining drivers of change are human inflicted and, moreover, are also interconnected: Beliefs (ie, the 7 Belief systems), Language, Technology, and Urbanization. Without language, humans would still be "just another" primate species (the Naked Ape, a Desmond Morris book). Language allowed the development of human beliefs. Else, humans would still be in the Needs stage (all Life), or in the Wants stage of Life (species using tools). Although some animal species appear to show religious behaviour, humans are the only species that have developed 7 distinct Belief systems: Love, Money, Philosophy, Politics, Religion, Science and the Truth. Both Technology and Urbanization would not have been possible without these 7 human Belief systems (and obviously Language also). 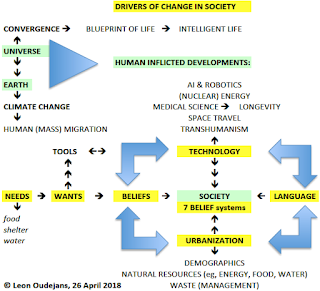 Both Technology and Urbanization have caused various derivative drivers of Change (see my diagram). While the impact of Technology on human societies is rather clear, the impact of Urbanization (my blogs) has long been underestimated. Only recently, water management in megacities is becoming an immediate problem (eg, 2004 article, RG 2005, RG 2006, WWF 2011). 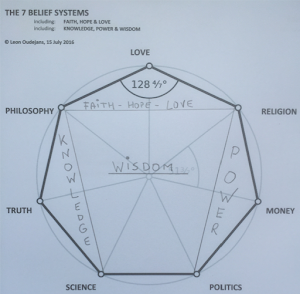 "The nature and structure of belief systems is important from the perspective of an informational theorist because beliefs are thought to provide the cognitive foundation of an attitude. In order to change an attitude, then, it is presumably necessary to modify the information on which that attitude rests. It is generally necessary, therefore, to change a person's beliefs, eliminate old beliefs or introduce new beliefs." A quote by Richard E. Petty and John T. Cacioppo from their 1981 book Attitudes & Persuasion. Know thyself a.k.a. Who am I? Can you actually find what you are looking for?